Your VIP experience awaits you with exclusive events, artist meet-and-greets, premium seating, and more! Most importantly, contributors to the 2019 Pittsburgh International Jazz Festival support year-round community engagement and educational programs. You are also a member of the August Wilson Cultural Center with your donation. *Benefits may be redeemed at the Pittsburgh International Jazz Festival presented by Citizens Bank from June 20-23, 2019. The African American Cultural Center, identification number 47-2697273, is a tax-exempt, non-profit entity under Internal Revenue Code Section 501(c)(3). The official registration and financial information for the African American Cultural Center may be obtained from the Pennsylvania Department of State by calling toll free within Pennsylvania, 1-800-732-0999. Registration does not imply endorsement. 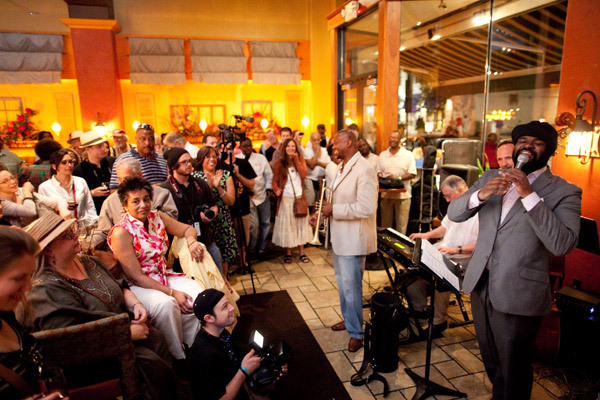 Sean Jones and Gregory Porter entertain the crowd at the Late Night Jam Session in 2011. Support the Pittsburgh International Jazz Festival!